Devotion is expressed and beautiful memories are cherished with this deep-hued and softly elegant wreath. Such a lovely reminder of your affection and respect. 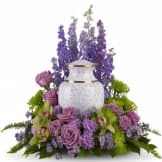 • A mix of dramatic flowers such as purple orchids and asters, orange, dark pink and lavender roses, pink and peach carnations, lavender larkspur, green chrysanthemums, and a range of pink blooms including oriental lilies, gerberas, snapdragons and more. 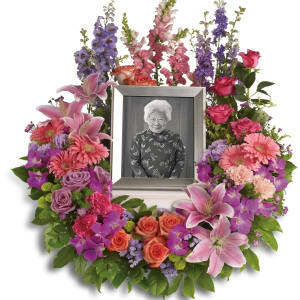 • This wreath will be hand arranged and delivered by a local florist. 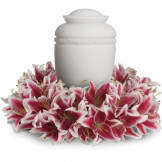 • This arrangement measures approximately 26" W X 31" H.